Are Your Car's Brake Pads Due to Be Replaced? Brake pads play an important role in the lifespan and effectiveness of your vehicle's disc braking system. The pads fit between the piston's caliper and the rotor for the axle. The pads absorb the intense friction that occurs when you press down on the brake pedal to slow or stop the car. After some time, those brake pads wear out. Heavy sport utility vehicles, trucks and vans often have ceramic brake pads. Most cars and other lighter weight vehicles have semi-metal brake pads. Stop-and-go driving causes brake pads to wear out faster. 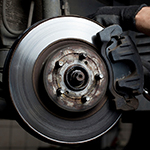 You may need new brake pads if it takes longer for your car to fully stop or the brakes squeak. Our team at Nelson Kia can check your brake pads. We're also prepared to handle any of your other automotive service needs.